Tuesday was pretty much a lost day in our household......it barely reached 40 degrees, it was quite windy....windy enough that it blew the pilot light out on the water heater four times.....and rainy....it rained all day.....all day. The weather channel (362 on DirecTV) was on in the back ground all day long.........I know, many people had a much worse day than I.......it seems there were a lot of tornadoes in many different places over the past few days, so my plight seems just a little minor compared to losing your home, or life. I should be grateful that my biggest problem is "cabin fever". After writing my daily blog entry, and having some breakfast I changed my clothes, and got back to the bathroom sink issue. There was one very, very small leak on the cold water side. Ultimately I had to removed the cold water valve, remove the brass reducer and re-apply "pipe dope" and then re-install everything. That did the trick......no more leaking and finally it was time to "button up" the faucet project after about 9.5 hours of effort. Right now I know way more about the space under our bathroom sink than I wish I did. I also learned it is amazing the positions in which one can contort one's 64 year old body when one must do so in order to finish a project. Right now it looks like one more bad weather day on Wednesday and then things begin to improve Thursday as the resident low pressure area begins to move off to make someone else's life miserable. At one point we had 4 electric heaters going......the water bay heater, the bedroom heater, a portable heater in the bathroom, and the front salon heater drawing about 40 amps......then I turned on the engine block heater (putting us a little over 50 amps for about an hour) as I needed to start the big Detroit Diesel to put air back in the air tanks that were reading under 100 psi......the only time I lose air that fast is when it is very cold for multiple days, which is what we have had. Normally I would see a reduction of a few psi over a week.....over 20 psi in just 3 days is a lot. So glad we have 50 amp service, which really means that we have access to 100 amps of power.....50 amp service means you have 50 amps on each power "leg", or blade, of the large four blade plug (one of the remaining blades is a neutral, and the other is a ground). We spent time reading the rest of the afternoon, watching weather reports, processing a large envelope of mail my son Chris had forwarded, and just relaxing.....there is really not much more to report, and that is the way some days go. We did receive some very disappointing news yesterday........a good friend of ours, Paul Snuffer (Alabama) has untreatable lung cancer. We've known his wife, Diane, since the 60's, and have spent time with them 3 times over the past few years......please keep them both in your thoughts and prayers. This devastating news just reaffirms our decision to retire early and travel....you don't know what is coming just around the next corner.......live life as if you had a few weeks to live. I've talked about the "Hockwald Way" a number of times over the past two years. The "Hockwald Way" defined simply, is any household repair job that should take 1 hour will take 4-5 hours including multiple trips to Home Depot, Lowe's and/or Ace Hardware. Monday such a job reared it's ugly head. 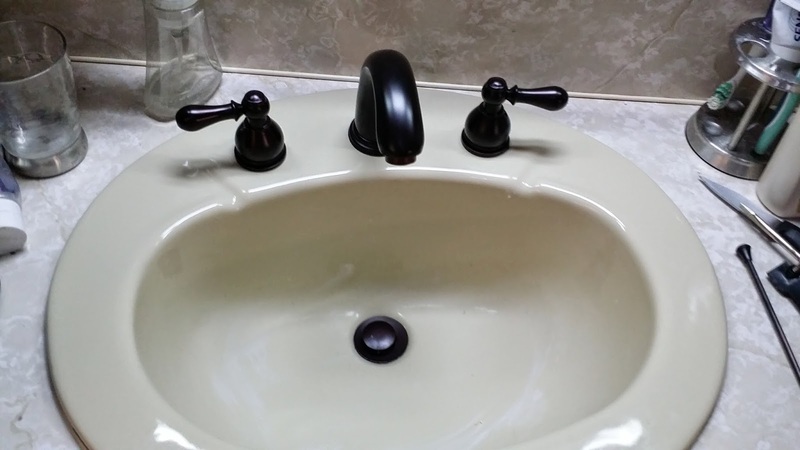 The faucet in our bathroom is as old as the coach, quite complicated to service, and it is showing many signs of its age. 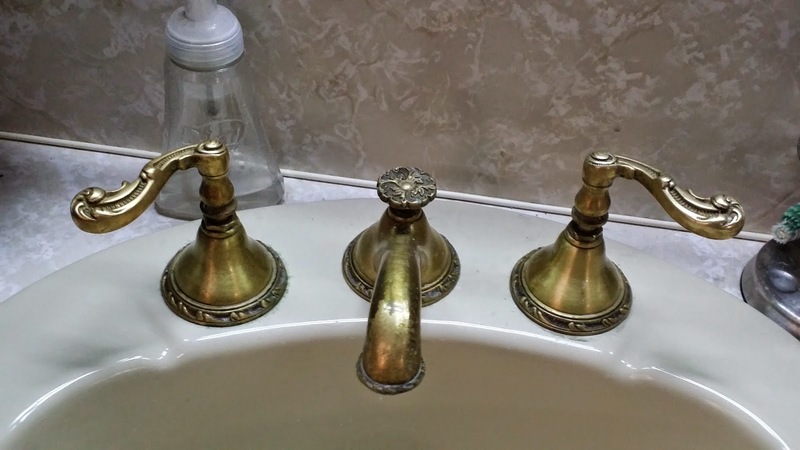 It is a quite ornate all brass 3 piece faucet, including the brass drain, ......there are no plastic parts whatsoever. Rather than try and service the faucet, which I understand is quite a job, I (we) thought we should just update the faucet with a new more modern 3 piece one. It seemed it would take less time to change it out than try and find parts for a 32 year old faucet. Of course, it never occurred to me that the "Hockwald Way" would turn this 2 hour job into an 8 hour, all day, knock down, drag out ordeal. The only bright spot was that NO trips to any home improvement store were needed......I had everything I needed on site......except for the requisite skill set needed to make the change out in a very small, cramped space in a short period of time. It started innocently enough when I began the removal of the old faucet around 10 am. I knew removing the old one would be difficult, so I was not surprised that it took over two hours to do so. Little did I know that this would be the easy part......by a long shot! 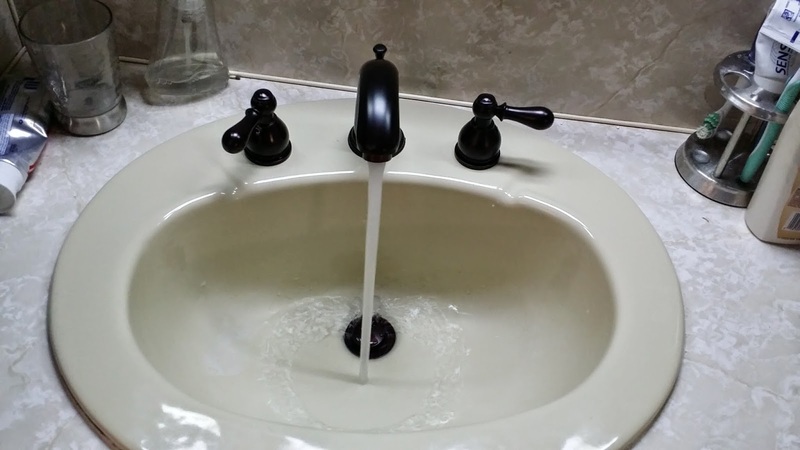 Once the old faucet was out I was able to install the new pieces pretty quickly.....that was the easy part. The "fun" part was reconnecting the water lines and drain. It seemed like as soon as I got one leaked stopped another sprung up. The time just melted away and before I knew it the clock was reading 4:45.......wait, what? I hadn't even eaten lunch. Finally, closing in on 6 pm I finally had everything working properly. Just a note here......the faucet is a good one.....the problem was not the faucet......the problem was the extremely tight space under the sink. Often I had to have TLE holding one wrench while I tightened something with the other.....there wasn't enough room for both my arms, or I sometimes just need one more hand. I finished the day with a teeny, tiny leak on the cold water side still which I will deal with Tuesday morning.....and I thought the bumper project was going to be the big time consumer.....lol! I took a long, long hot shower and then took a few Ibupropens to ease the pain incurred from working in a very tight space for almost 8 hours.......8 hours.....wow!! It is still raining here in Sioux Falls Tuesday morning, and the wind is still blowing out of the east at a steady 20-25 mph........this is the most wintery weather we have experienced in the last 6 months, and it is well into Spring now! You will recall we arrived in Sioux Falls with a strong east wind buffeting us to and fro on the Interstate. That wind was the precursor of rain, but in spite of the rain having arrived around noon Sunday, the wind continues almost unabated now for 48 hours. We are thankful we are parked with the nose of our coach into the wind otherwise we would be rocking and rolling. Of course, this is always the risk one takes when one moves too far north too soon in the year. Our primary reason for venturing as far north of Sioux Falls this early in the Spring was to retrieve our new rear bumper, but in addition to the bumper, coming back to Sioux Falls has enabled us to spend more time with our Newell friends Todd and Dawn. Also, as is the custom in our Newell community, we help each other with projects on our coaches. For Todd there was the need to replace two failing electric heaters in his coach with new ones. Before Todd came over to the fairgrounds Sunday with his coach I began work on removing my old rear bumper.....this is pretty much a one man job. Just after Todd arrived with his Newell the forecast rain began to gently fall essentially ending my outside work for the day, but I did get a lot accomplished. The old bumper is off, and the right rear corner is now a little closer to its original shape....you can tell that a little more by looking the first picture below. When it stops raining in the next couple of days I'll begin attaching the diamond plate to each corner, then install the new bumper. The only reason I am putting diamond plate on each corner is just to give the rear of the coach a symmetrical look. There is no damage to the left corner, but it would look odd, at least to me, if there was only diamond plate on the right side. The old bumper is removed! 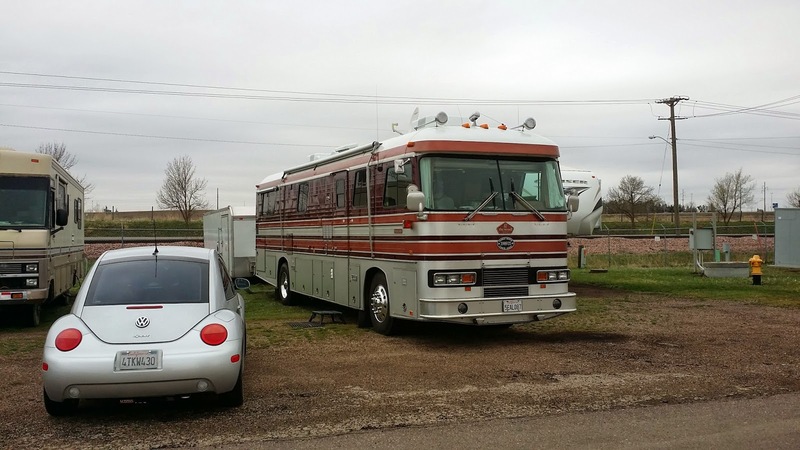 We then moved inside Todd's coach to begin removing his old heaters and installing the new ones. It was a slow process, but by 5 pm we had the new heaters installed and warming the coach. Todd handled the job of removing the old heaters, and enlarging the openings for the new heaters with a jigsaw....I handled the wiring and installation of the new heaters. A note of explanation....some have asked "what happened?" to the rear bumper and rear corner of our coach? Well, when we purchased our Newell in March of 2008 the right rear corner of the bumper had some minor damaged that wasn't too noticeable and we were content to leave it as is, especially when we found out that Newell wanted $700 for a new bumper. However, two summers ago (July of 2012) we were arriving at an RV park near Marblemount, WA when I overshot the entrance. I couldn't back up at the time as we were on a two lane country road with traffic behind us. After the traffic passed I decided to take advantage of a side dirt road with a very wide apron and attempted to back into the dirt road to make a 3 point turn. The Lovely Elaine offered to get out and help me back up, but I replied "It's okay, I've got this"......the words were still hanging there in the air when I heard TLE gasp....."you just pinched the trailer!". That mistake further damaged the bumper, but also caused serious damage to the aluminum skin on the right rear corner. I was able to pound out the damage and covered the tear in the aluminum with some aluminum foil tape. We were still content to live with the damage, but when we found the Newell bumper on eBay for $62.50 we jumped on it and bought it, and devised the plan to cover the damaged corner with diamond plate. So there you go....that's the back story. Around 5:30 we drove over to Todd and Dawn's home for dinner.....Dawn is a wonderful chef by the way......for swordfish, steak and some healthy sides. We talked until almost 9 pm before heading home for the evening with big smiles on our faces. The overnight temps in O'Neill got down to the mid 50's......probably the highest "low" temperature we have seen in some time. Saturday began sunny, balmy and windless. All that being said, we knew the wind was going to arrive big time from the east about mid morning, so we started our wheels rolling the last 177 miles to Sioux Falls around 7:50 am hoping to get a big chunk of that mileage in before it got bad. We continued north on US 281 watching the lovely town of O'Neill, NE grow ever smaller in our rear view mirrors. 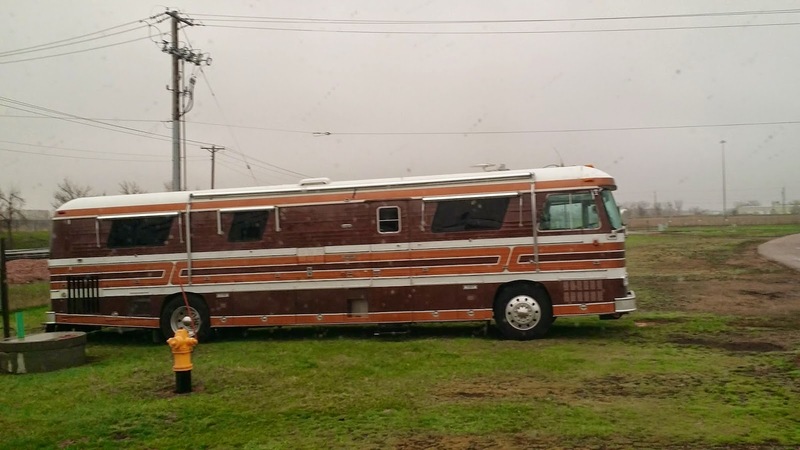 There was a light wind from the east, but it didn't really affect the handling of the coach at all, however, I knew once we turned east on SR 46 to make our 80+ mile run to I-29 it would be hitting us directly on the nose of the coach at about 25-30 mph. US 281 took us steadily northeast until we hit the Missouri River and Fort Randall Dam where we transitioned to SR 46 which would take us over 80 miles on a straight line to I-29. As we turned due east the wind became ferociously strong gusting over 40 mph at times, but as long as our nose was directly into the wind it was not too hard to control the coach. As it turned out driving 80+ miles into the wind was the easy part of the drive. Once we turned north on I-29 the real work began.....by this time it was 11 am and the east wind was consistently over 30 mph.....I had to crank the steering wheel hard to the right to steer into the wind, and every time we passed under a bridge I would have quickly correct back to the left as the east wind would be blocked for a second. Thankfully it was only 30 miles to the 12th Street exit......our turn off for the W.H. Lyons Fairgrounds. The fairgrounds RV park is just opening for the season and there are only a few electrical pedestals with power to them at this point, nevertheless we were able to snag the last site with full hookups. Around 2 my good friend Todd Flickema brought over the new bumper I bought ob eBay back in December. The auction was for the front and rear bumpers.....Todd has a 1984 Newell which needs a new front bumper, and I needed the rear bumper, so I won the auction for $125 (total) which we split 50/50, and he drove down to Nebraska and picked them up. Sunday we will install both our bumpers. In addition to the bumper, I am going to install a new bathroom faucet and drain as well.......that along with several other small projects will keep us busy most of the week. 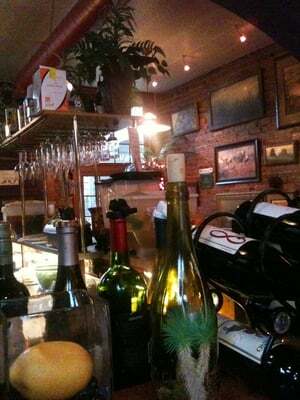 Around 5:45 we drove into old town Sioux Falls to meet Todd and Dawn for dinner at Mama Lada's.....a cool, funky enchilada shop and wine bar with about 6 tables. We spent about 3 hours together talking about "cabbages and kings". 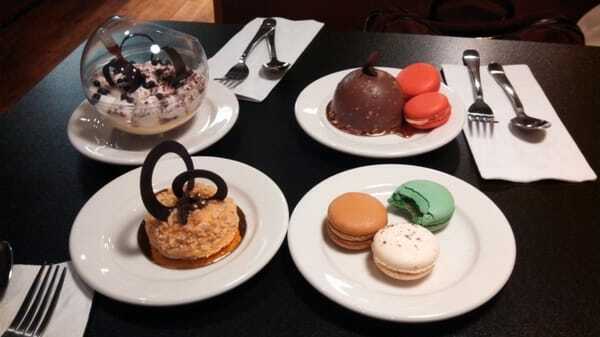 From there we walked a couple of blocks over to Ch Patisserie for coffee and desert.....yum! What a great evening spent with good friends! We parted ways about 9:15 heading for our "home on wheels" for the evening..........thanks for stopping by! I like secondary roads a lot, and have rarely ever been disappointed....I say rarely, because there have been a couple of times when I was wondered, sometimes quite out loud, why I had chosen that particular road. 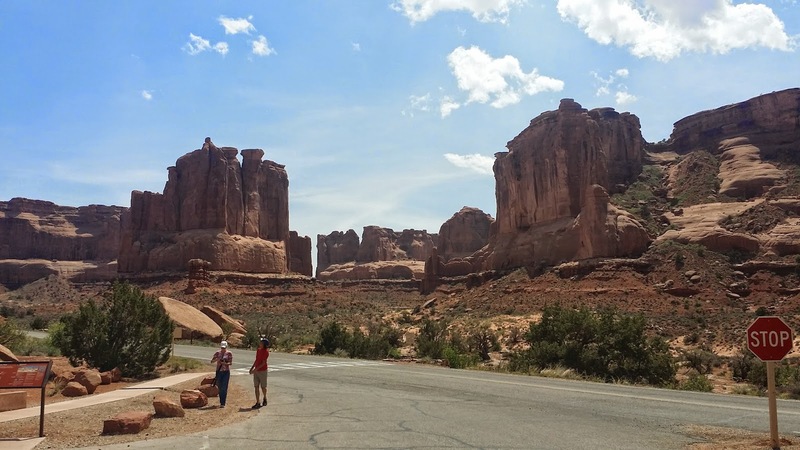 It's easy to just cruise the Interstates, and most often it is the easiest way to travel east, west, north and south, but after a while you've seen all there is to see along the Interstates and want to see something different. My quandary is I have a "big rig" and don't want to end up on a road that is too narrow for me, or in poor condition. The year we were headed to Amazon in Campbellsville, KY my mapping program led me on to a very, very narrow road. When cars were approaching me I had to almost pull on to the shoulder to let them by......once I was committed to that road there was no turning around......literally. It was the worst coach driving experience I have ever had, and I still wonder how I drove that 35 miles without putting the coach in the ditch. It is that memory which always makes me a littel queasy when we decide to take a secondary route to a destination, such as we did Friday. Ironically, the shortest distance, by a lot, was to take a "zia zaggy" route up to Sioux Falls from North Platte. 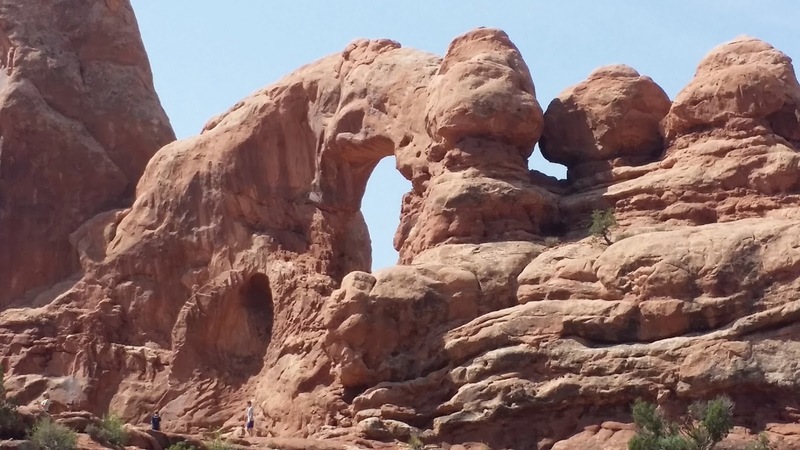 Taking the Interstates would have added close to 80 miles to our drive, and besides.....we've already seen that scenery before. Our route would take us on 9.....count them.....9 different US and State highways just on Friday.....on Saturday we will traverse 3 more......so a total of 12 different roads.......that is not what I do......I like to drive in straight lines. Well this day I decided, "why not?" and just decided to follow my mapping program's advice. Surprisingly once I got used to changing directions every 15-30 miles I was fine. The roads were in pretty good shape, with some in marvelous, almost new condition. The one thing about doing this in farm country is there are no straight lines.....the roads tend to follow property lines, and also tend to go up and down a lot.....I mean a lot. We did enjoy driving these back roads through the heart of Nebraska, but sometimes, like Friday, it takes a lot more energy to do so. Nevertheless, on Friday we drove 203 miles of secondary roads (10 of those miles were due to a navigational error on my part) to O'Neill, NE arriving around 1:30 at Carney Park. I found Carney Park on RVParkReviews.com once again.....this little city park offers three days of free camping with water and 20, 30, or 50 amp electric service. After three days it is $10/day......still not bad, huh? Of course, as the sign below says, they do appreciate donations, and we will be sure to leave a donation for them before we leave. My first order of business after we arrived was to take advantage of the location and wash the trailer and coach which were absolutely filthy. After driving through melting snow a couple of times (going north from Cottonwood, AZ to Flagstaff, AZ and then over the Continental Divide), plus a couple of rain storms (coming into Ft. Morgan, CO) it was time for a thorough cleaning with water. It took about 2 hours in all, but it was worth it.....now my baby looks like herself again! I'm so glad I had the coach waxed before we left Rancho Jurupa Regional Park, because that really made the job so much easier. Usually when I wash the trailer and coach it takes me three, or four hours, but the dirt just washed right off. TLE had a snack ready for me when I finished, and then I took a shower. By this time it was after 4 and time for a nap.....for me. We spent the rest of the day reading, and enjoying the quiet of this neat city park. I am finding there are a lot of these city parks in the midwest where the fee ranges from free to $10, or $12 bucks per day. Saturday we will complete our drive up to Sioux Falls where we will stay at the fairgrounds for a week, or so.....I'm so looking forward to installing my new bumper! There are just some travel days that will stick in your mind for a long, long time. Thursday was such a day for us. We awoke to clear skies after the storm the night before, but there was still some hint of wind from the north/northwest. It's amazing how a little sunshine, and clear skies will change your perspective on a place. Riverside Park, where we overnighted, was looking much more inviting than when we arrived. We decided not to have breakfast right away, but wait until the first rest stop in Julesburg, CO, just a few miles from the Nebraska border. As we cruised north and east the wind subsided gradually. The road was flat and straight, and the cruise control was working wonderfully.....I just held on to the steering wheel and enjoyed the drive. I-76 from Denver up to I-80 where it ends has a lot of rough patches. There is a lot of road work going on right now, so it appears they are trying to fix those areas. Eventually the road smoothed out, and the wind, although somewhat abated, turned into a tail wind. When that happens it gets so quiet! You feel as if you are just floating down the road....and that is how the rest of the day went for us. We took the aforementioned break in Julesburg at a very nice rest area, which doubles as a visitor's center. TLE discovered they have a lending library where she found four books she hadn't read, and exchanged them for four she had already read.....okay, that's good.....4 out and 4 in.....I like the symmetry of that, but balance would be upset later in the day.....stay tuned. Our total driving distance to North Platte, our day's destination, was 182 miles. I could have driven twice that distance with no side wind, and no road so rough it shakes your eye teeth loose. I was almost disappointed when I saw exit 177 come into view, but was happy to return to one of our favorite overnight parking spots in the midwest....oh, by the way, we are now in the Central Time Zone once again. A couple of years ago we spent two nights in the Walmart parking lot here. We rode our bikes all over and saw quite a few interesting things....you can read about it here. Ironically we experienced the same type of conditions the last time we arrived here only going east to west that time.....a nice tailwind all day, and a smooth highway. There is just something about North Platte, NE! Our original ETA for North Platte was 1 pm, but with the time change it was suddenly 2 pm, not 1 pm! While I was parking our coach TLE had been on Yelp looking for a place to have a late lunch.......there is a new place in town called Bailey's American Cuisine, virtually right across the street from the Walmart parking lot.....it is in a very new building that was not here two years ago. About 2:15 we walked across the street to Bailey's and immediately ordered two local Nebraska seasonal brews called Thunderhead Jalapeno....WOW! Make that two! For lunch I had the Blackened Salmon salad, and TLE had the Mac 'n Cheese......that Mac 'n Cheese was like no other I have ever tasted, however, I loved my choice and cherished every bite. After lunch we walked a block down the street to the local Goodwill store that we had spied as we crossed the street to Bailey's. This is where the book symmetry was upset.......TLE found 4 more books she hadn't read, so now the book collection has grown by a net 4....I don't know where she is putting those books, but if she buys many more she'll have to hold them in her lap. By the time we finished our walk back to the coach it was going on 5 pm and it was time for a nap.....at least for me. I woke up about an hour later feeling refreshed, and suggested we walk into the Walmart to pick up some chips to go with the promised "street tacos" I was having for dinner. Around 7 we ate dinner....by the time the sun had set we found ourselves in the middle of the proverbial "RV" ghetto.....no less than 10 more RV's had joined us in this, apparently, well known overnight spot. As I write this post they are pulling out one by one to continue their journeys east, west, north and south. In honor of "Throwback Thursday" here is a picture of TLE and I in Kauai on our 20th anniversary back in 1991. Thanks for stopping by......and also, thank you to those who became followers yesterday, and pushed us over the 100 mark.....we are now at 101......a big thanks to Laurie May and Cathy McAuliffe-Dickerson for becoming the 99th and 100th members respectively! We awoke Wednesday morning around 5 am, and were walking towards Starbucks by 5:30 for coffee, a bagel (or croissant) and free broadband with which to post my blog. It wasn't too cold, but it was still breezy with a hint of more to come later. We were pretty much the first customers of the day as it appeared they were still setting up, but we had our coffee and pastries within just a few minutes. By the time I posted my blog and had finished my venti (20 oz) coffee it was about 6:45 and time to get ready to roll the wheels by 7....we wanted to do the long climb with the cool morning temperatures. It hadn't gotten too cold the night before so I decided to forego running the generator to run the block heater and just turn the key.....the DD started right up! Yay! We were on the road by 7:10 and starting our upward climb from around 5,300' in Rifle, CO to 11,158' at the Eisenhower Tunnel. After clearing Vail Pass we took a break at Dillon Reservoir (9,300') at this very scenic Rest Area.....it is still frozen! The Eisenhower Tunnels is one of the highest vehicular tunnels in the world, and is 1.697 miles long if you are going eastbound. Thankfully the traffic was quite light this Wednesday morning so the tunnel did not feel too claustrophobic. Once we had cleared the final pass it was all downhill into the Denver Metro area. Our gamble to only put in $100 worth of diesel in Grand Junction paid off as we arrived at the Sooper King (supermarket chain....part of Kroger's) fuel station with about 35 gallons left in the tank. We were able to use our Kroger's customer card to get 10 cents off the first 63 gallons ($3.59/gallon) and then paid $3.66 for the remaining 72 gallons.....for a total of 135 gallons. From there we headed over to Westminster, CO to a local Walmart Supercenter that had been recommended to us by our friends David and Denise. It was right across the street from a Lowe's so we were hoping to be able to use their (Lowe's) WiFi while we over nighted there. That dream was short lived.....within 20 minutes of our arrival we were advised by the manager of the Walmart that the City of Westminster, in their infinite wisdom, prohibited overnight parking of RV's anywhere within their city limits. So, that ruled out moving across the street to the Lowe's. Okay, this happens once in a long while.....a long, long while.....the last time was in March of 2012 in Jacksonville, FL. She advised, however, that the Walmart Supercenter in Thornton (just back down the Interstate at 104th street) did allow overnight parking.......well, they used to.....we had barely arrived at the Thornton Walmart when we were advised by their manager that the local PD was having RV's towed.....hmmmmm....what to do? I checked with the Cracker Barrel just a few exits back up the Interstate from where we had just come in the lovely burg of North Glenn and was advised the same. Wow, that's the first time we have ever been shut out. After some discussion, and checking places east of Denver on I-76 we found a free campsite in the lovely, welcoming town of Ft. Morgan at Riverside Park. I found this on RVParkReviews.com.....they offer free overnight camping with either 20 amp, or 30 amp receptacles available.....no water, or sewer, but what a deal! So, we got back on the Interstate bidding farewell to the Denver Metro area, and headed east 78 miles to the rural farm town of Ft. Morgan. The wind was coming from the north at a steady 25-30 mph as we cruised northeast, which forced me to steer leftward into the wind to go straight....it was a struggle! On top of that we were driving into a rain storm. We arrived in Ft. Moran just before 4 pm, but it looked like it was evening already with the heavy cloud cover. We were able to snag one of the 30 amp sites....they are all laid out end to end along a median, and were plugged in just before the storm broke hard.....there was lightning, thunder and rain on and off most of the evening. The forecast for Thursday is clear skies, but continued wind. We have been blessed over the past 27 months with very little wind on the days we were traveling, so I guess once and while we have to pay our dues and take a little punishment like everyone else. We try to avoid driving in the wind, just like we try to avoid driving at night, but sometimes it just does not work out. We spent the evening watching Survivor and a few Fraser's then were off to bed by 11.....Thursday we will continue our northeastward trek to North Platte, NE.....one of our favorite mid-west towns. P.S. - We are now up to 98 followers! Just two more to reach 100.....if you are not currently a follower will you help us break through that 100 follower barrier today? 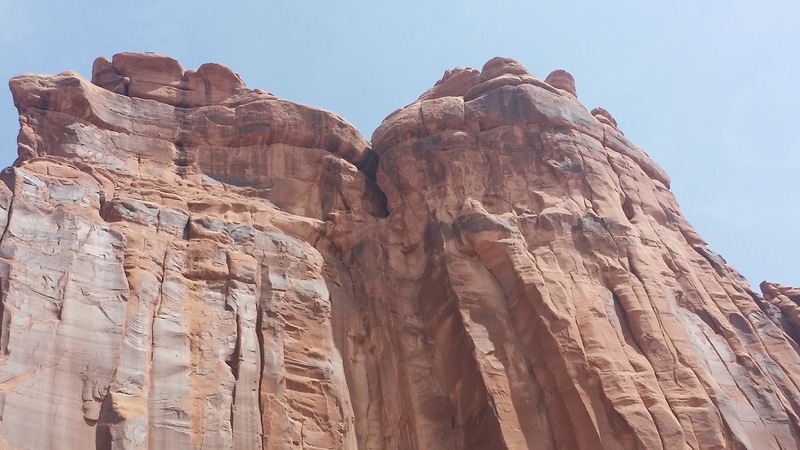 After spending the past few weeks in northern Arizona and southeaster Utah searching for new adjectives to describe what we saw it was time to begin our dash for Sioux Falls, SD. 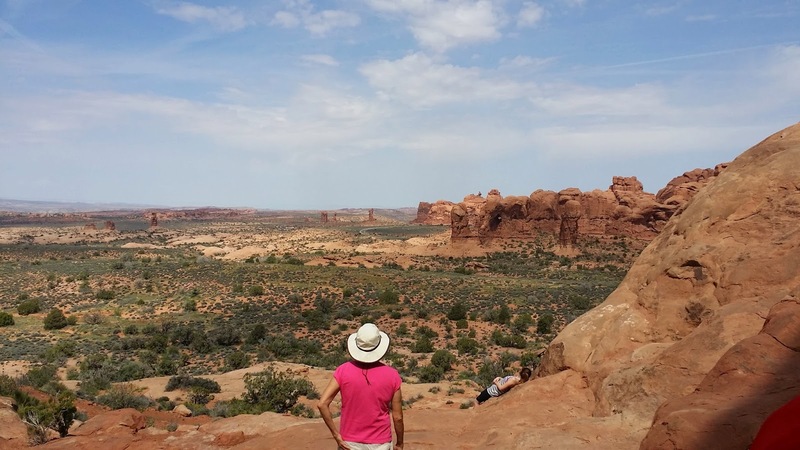 We had a lovely, delightful time in Moab with our friends......let me just say once again that having a circle of friends you hook up with on the road is one of the things that is so attractive about the nomadic life. 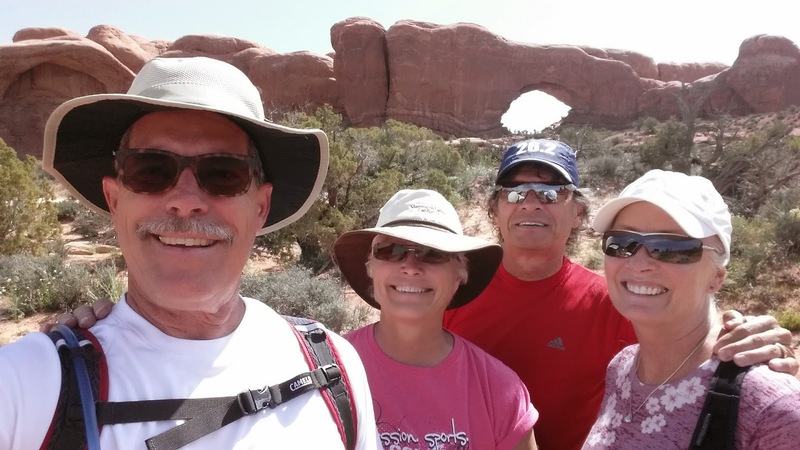 Being able to meet up with David, Denise, John and Patty was the frosting on the nomadic cake. Our first task of the day was to drop the trailer and drive the coach over to Chip's Grand Tire Pros to have the right rear inside tire replaced......why is it always the inside tire? Why? We arrived at Chip's a little after 8:30 and within 20 minutes they were at work removing first the outside wheel, then the inside wheel......there are 10 lug nuts that hold the outside tire to the hub, and then 10 more that hold the inside tire in place. Out of 20 lug nuts there is always, and I mean ALWAYS, one stubborn nut that will not come off easily. After a little gentle persuasion from a shop hammer the nut gave up and came off. As it turns out the tire was in worse condition than I suspected. Once it was off and you could see the inside part of the tread more clearly you could see a lot of "cupping" and unusual wear.....all signs of something going wrong internally in that tire. Fortunately for our wallet the other three still look pristine. These rear tires are just approaching the 5.5 year mark. Typically you can get 5-6 years out of a set of RV tires so one failing at this point with over 43,000 miles on it does not surprise me. I was hoping we could make it to October before we replaced all 4, and we may yet make it on the last 3. As I said, the tread looks great.....no evidence of any unusual wear patterns. We were out the door by 9:40 after paying our $428 bill (included labor, disposal, and 3, or 4 other odd taxes Utah charges).....the tire only cost $385 of that total....not a bad deal. We were back to the park just before 10, and on our way by 10:12 (according to TLE) after hooking up the trailer and inserting the VW back in its travel space. 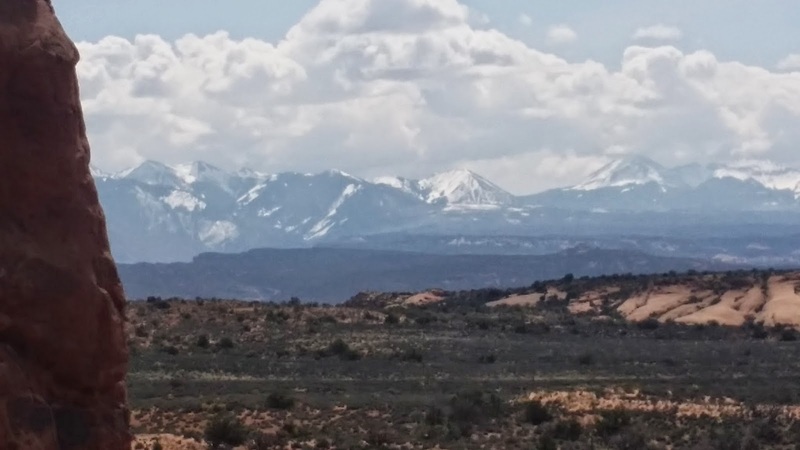 From there it was 30 miles north to I-70 and then another 138 east to Rifle, CO.
We are so glad we got out of Moab relatively early as there were high winds forecast for the afternoon, and we wanted to be well on our way east where the winds were forecast to be less fierce. Nonetheless, we did encounter a heavy side wind from the south as we left the Rest Area in Fruita, CO. Added to that was road construction which limited us to one lane of travel for much of the remaining 59 miles into Rifle. We exited the Interstate just 11 miles later to take on $100 worth of fuel at the local Safeway fuel station where we got 10 cents off the 25 gallons we took on. Getting in and out of that station was a little tricky but it all worked out in the end.....we were in no hurry. With that additional 25 gallons I think we can comfortably get over the Rockies before we fill completely up. I didn't want to start the climb with a full 180 gallons on board....I think we have about 75 right now. We arrived in Rifle around 2 pm, and found a spot to park on the east side of the parking lot for the night at the Walmart Supercenter on Airport Road. A very nice Walmart, but a tight parking lot. Fortunately there were only two other RV's there for the night when the sun set. Once we were parked we decided to walk over to the local Starbucks for coffee and a bagel, and just unwind after our 168 mile trek. The outside temps were quite balmy in the mid 70's and there was still a stiff wind coming from the south, but it's all good......the entire day was without event, and that is pretty much what we hope for each day when we are moving. Around 5 pm we walked over to the Rib City Grill, just another block, or 2 past Starbucks for dinner. TLE and I split a combo order of St. Louis Ribs and Baby Back Ribs as well as an appetizer of fried okra.....that is the only way I will eat okra....never eat it boiled....NEVER! It was just the right amount for us. Of course there was a Fat Tire Ale draft for me.....a small one! Well, Monday was just an amazing day. Every time we think we have seen it all, and it can't get any better, it does. But, before I get to that let me update you on the right, rear, inside tire issue. I got a call back from Good Sam ERS Monday morning advising they had found a mobile tire service, but they were not local......they were 100 miles away in Cortez, CO. The price of the tire was in line, but the Good Sam ERS guy advised I would have to pay for the return trip....they would pay only one way. Ultimately my costs using their mobile guy would be upwards of $760. That was not what I was expecting, so I declined and sought out my own local solution. 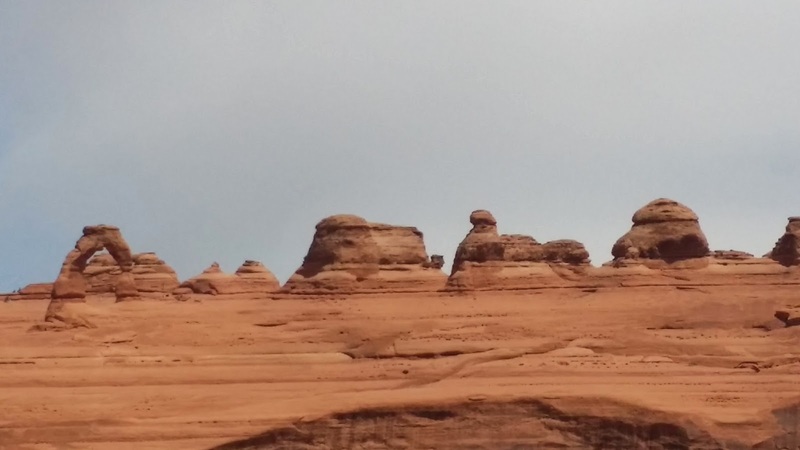 I found a local tire shop right here in Moab....only a mile away from our current location.....where I will take the coach Tuesday morning to have the tire replaced.....cost is $440, including labor and disposal charges. 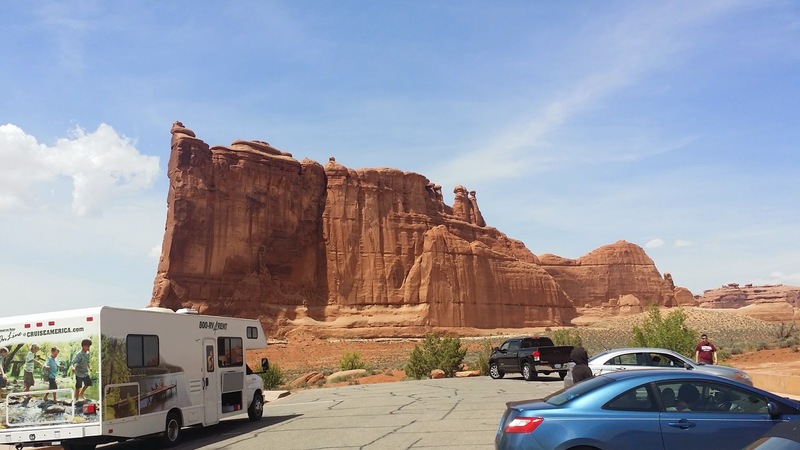 We'll drop the trailer here at the park and pick it up on our way out of town as we head north to I-70. 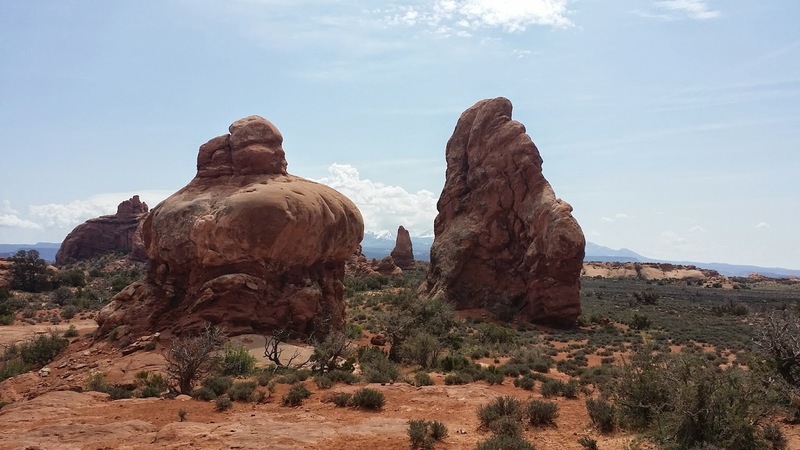 By the time that was resolved, and we had moved our coach to site #44 it was after 10, so we got together with David, Denise, John and Patty and headed over to Arches National Park to spend the day searching for new adjectives to describe what we saw. I'll let the pictures speak for themselves. David and Denise rode with us in the VW all day as we traversed around the park. John and Patty have a couple of mopeds they rode with their little dog Bayley. 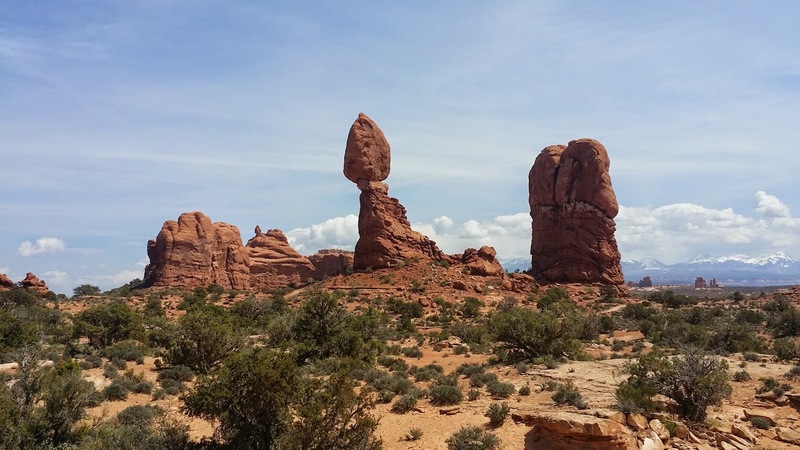 We met up with them at "Devil's Garden" for lunch, and then continued our tour. 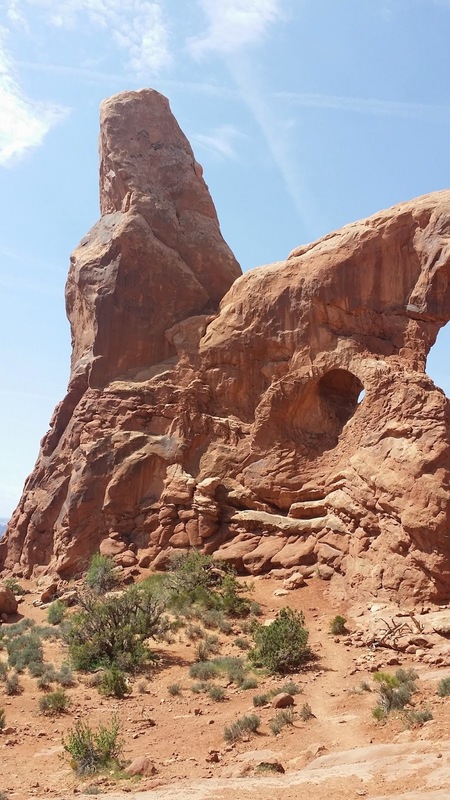 There a few long hikes we would like to take in the future when we come back.....and we will come back.....there is still Bryce, Zion, Capitol Reef, and much, much more to see, not to mention all the mountain bike opportunities. 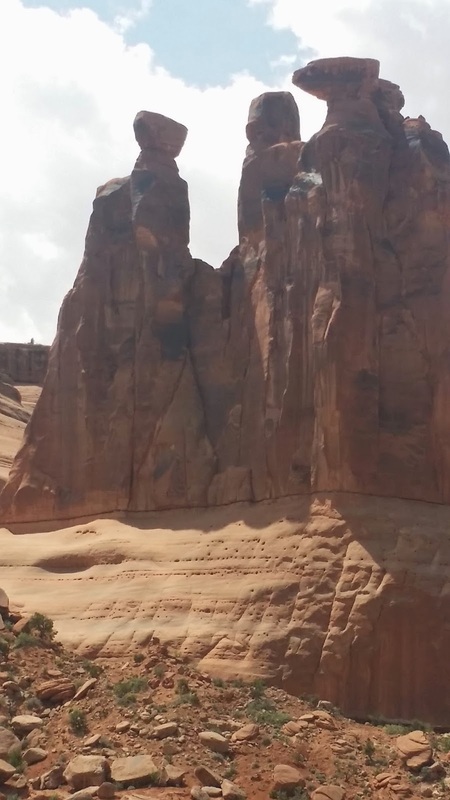 There was not enough time this time around to see and do everything, but I think we certainly got a good taste of Moab and its surrounds. Speaking of "good taste"......around 5 we all drove into downtown Moab to have dinner and a couple of brews at "Moab Brewing Company". 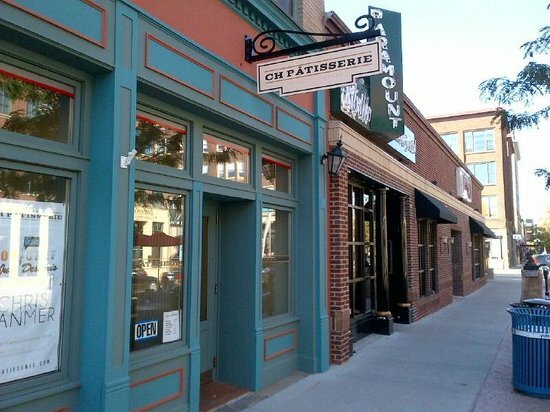 Several of our friends who have been here before said we had to check it out, and we were not disappointed. TLE and I had a couple of seasonal Chocolate Porters, and they were very, very good. I had the fish tacos, which I highly recommend. 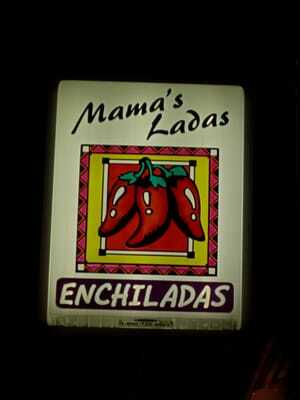 You get three tacos along with their veggee chili.....yum! Yelp only gives them 3.5 stars, and I am mystified by that. We all agreed this was at least a 4, if not a 4.5 star place......great service, ambiance, brews and food! The place is enormous, and was packed. You can see why many feel it is the best place in town. 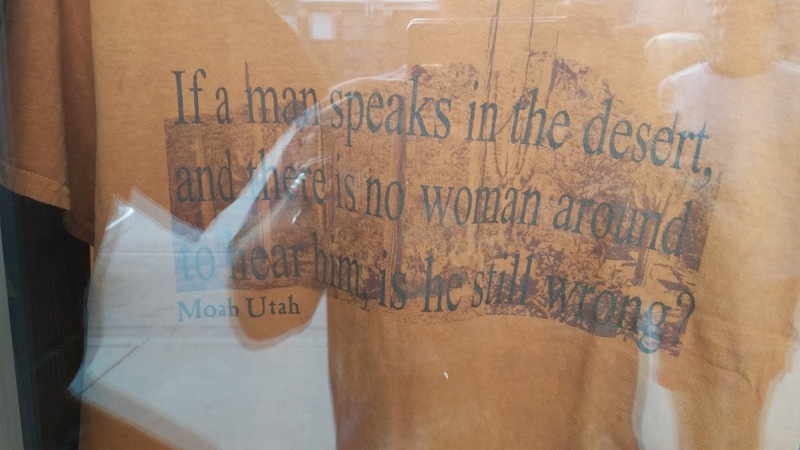 In case you have difficulty reading this (I took the picture through a window) it says "If a man speaks in the desert, and there is no woman around to hear him, is he still wrong?" I really got a kick out of that......by the way Denise, TLE and Patty all said "YES!" I actually found two more license plates (Arkansas and Georgia) for my collection in a little gift shop. 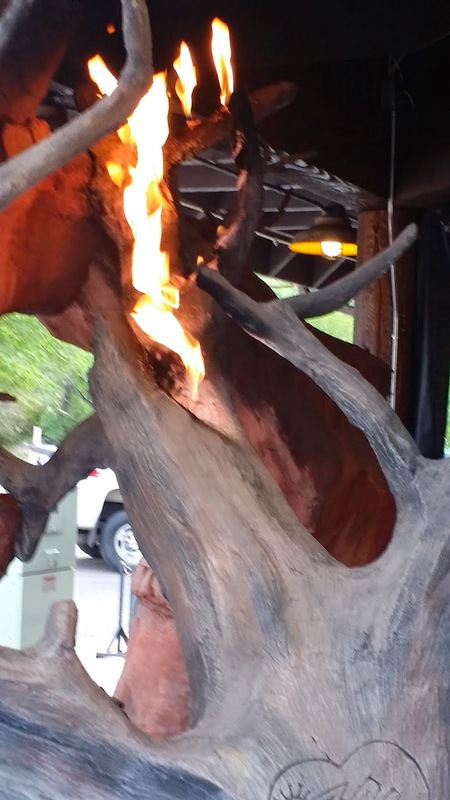 At one point we walked by a restaurant with al fresco dining and saw this tree sculpture (above) with a gas flame coming out of it....thought is was pretty cool. That was our day, and what a splendid day it was......Tuesday we move on north and east into Colorado.....we hope to be in Sioux Falls by Saturday. We'll pretty much be moving every single day now for the next 5 days and probably utilizing a number of Walmarts, Lowe's, Cracker Barrels as we go. P.S. - If you have not become a follower yet please, if you are so inclined, click on the "Join This Site" button to the right of the blog.....we're almost to 100! Miss Serendipity called my "Bluff"